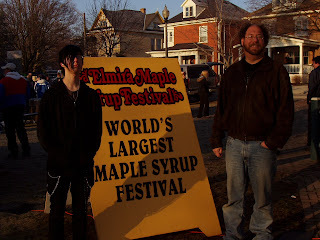 Yesterday was the 44th Annual Maple Syrup Festival in Elmira, Ontario, Canada. 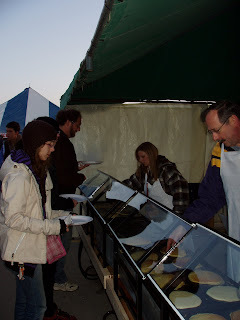 As a family, we were waiting in line for our pancakes by 6:45 am. It was still a bit nippy, but the line-up is shorter at that time. 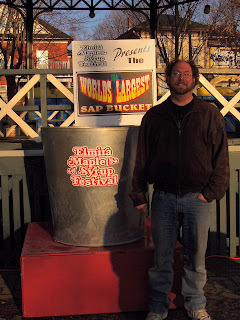 Both the festival and the sap bucket have been certified by Guinness Book of World Records as the world's largest. 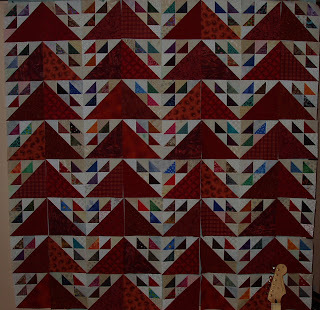 The third picture is a view inside the pancake tent. The pancakes are the size of the plate my daughter is holding. Two of those are enough to take the hunger edge off most attendees. Remember, they are slathered in a large ladle of pure syrup. yummy!!! 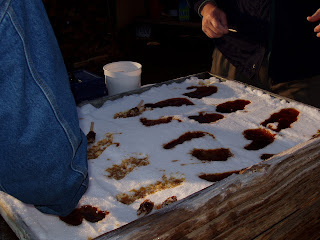 The fourth picture shows syrup that has been boiled to the taffy stage, it is then poured on the snow to cool, then rolled around a stick so that you can pick it up to eat.